Sometimes truth can be fiction. 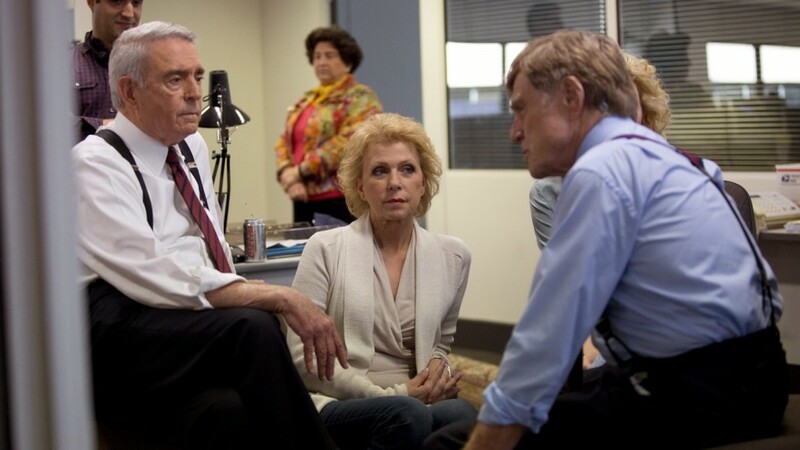 Truth, the film based on a news scandal that cost veteran CBS Evening News anchor Dan Rather his post, is a well-made, well-acted film, though whether it is a whitewashing and historic revision of what actually occurred is a subject of debate. Truth proves that films are not documentaries (which themselves can be if not flat-out deceiving at least capable of being geared to reach a foregone conclusion). How much truth there is in Truth, therefore, depends greatly on what you believe to be true. CBS News producer Mary Mapes (Cate Blanchett) has done great work exposing the Abu Ghraib abuse scandal, and now she has a hot tip for another potentially great story. There are documents that purport to reveal that then-President George W. Bush, deep in his reelection bid, may have received preferential treatment whilst in the Texas Air National Guard. They appear to show that the future President had been basically allowed to go AWOL and not finish his service in a unit filled with the scions of Texas' rich and powerful. This has all the earmarks of a great investigative piece. Unfortunately, Mapes discovers that the documents are not the genuine ones but photocopies, handed to her by Lt. Colonel Bill Burkett (Stacey Keach), who is ill, and who in turn received them in what appear to be very cloak-and-dagger circumstances. Into this comes Mapes' mentor, Dan Rather (Robert Redford), who is eager about a story involving the past military experience of the President, especially since his Democratic opponent, John Kerry, has built his entire career on his own Vietnam War experiences (and those were being questioned at the time of the campaign). This story is investigated, found to be accurate, but scheduling conflicts at CBS make it nearly impossible to fully vet everything. They have to either get this story on the air in five days...or wait until perhaps after the election. This is too great a story to have wait, and CBS' 60 Minutes II goes on air with it. Once the news crew stops congratulating itself for a job well done, the real scandal begins. Within hours of the 'Killian Documents' story broadcast, right-wing blogs begin to poke holes in the story. Chief among the accusations is that the documents are forgeries, having been made recently and made to look like they were thirty-plus years old. CBS, Mapes, and Rather all stood by their story, but soon other media outlets and partisans began finding that there was too much doubt as to whether the documents were genuine (in particular the fact that it was copies, not the originals said to have been burned, that were the documents establishing this story). Mapes, Rather, and her two producing assistants, Lt. Col. Charles Rogers (Dennis Quaid) and Mike Smith (Topher Grace) kept insisting their story was accurate. However, their competition and the organizations with vested interest continued to question the authenticity of the documents, finding evidence that perhaps they were forgeries (or at the very least, CBS had done a slapdash job of authentication to get a story on air prior to the election...with political motives perhaps at play). The ensuing scandal brought about an investigation at "Black Rock" (the CBS Corporate headquarters). It is here that Mary Mapes, a very harassed woman finding herself under siege on all fronts (even from her abusive father who denounces her as a left-wing harpy), is sacrificed to save CBS more embarrassment. She loses her job, and Dan Rather is essentially forced out, his journalistic career brought to ruin. It takes a particular type of film to call itself Truth when the story involves potential lies and deception. It is not my place to decide whether the events in Truth are wholly accurate. Director/writer James Vanderbilt based the film on Mapes' memoir on the whole affair: Truth and Duty: The Press, The President, and the Privilege of Power. As a result, we start from the perspective that Mapes is the heroine of the story and as such, Truth is already biased in favor of one side. In short, Truth already starts with a handicap in that the story is going to be not a story about what actually happened, but about perhaps Mapes attempting to restore her reputation. As a side note, I love the alliteration of Mapes' book. This desire to paint Mapes as a journalistic Joan of Arc takes its lowest point when she confronts the nefarious (and all-male) investigative commission. Here, her accusers are asking if her 'liberalism', real or perceived, influenced her decision to air the Bush story. I would say that this is a legitimate question, especially when there is a brief mention that Mapes helped facilitate contact between Burkett and the Kerry campaign. Mapes takes umbrage at this suggestion, then confronts her accusers by asking if what they want to ask her is, "Am I now or have I ever been a liberal?" It was at this moment that I felt Truth went overboard. Clearly Mapes was attempting to equate her 'trial' with the House Un-American Activities Committee that would ask those it dragged, "Are you now or have you ever been a member of the Communist Party?" I would argue that there is a marked difference between those who were persecuted for their former/current leftist views...and someone who appeared never to wonder whether she was rushing to broadcast a story that had not been as well-vetted as perhaps it should have. In the film, no one questions whether the Killian Documents story needed to air with such a brief timeframe to investigate every aspect, to make sure the whole thing was locked down. It seems in retrospect almost amusing to see how the same press that went after the Bush Administration for rushing into war in Iraq with questionable evidence would then feel that they could rush into a news-story that would clearly have an effect on an election with questionable evidence. Furthermore, in some respects Mapes and Rather came off a bit bad in this. They had a strong defensiveness bordering on arrogance when other outlets (legitimate and otherwise) began to question whether at best CBS had been duped, at worst was flat-out lying in its 60 Minutes II segment. Mapes in particular appears to be infuriated that she would be questioned, let alone questioned by people who were her inferiors. 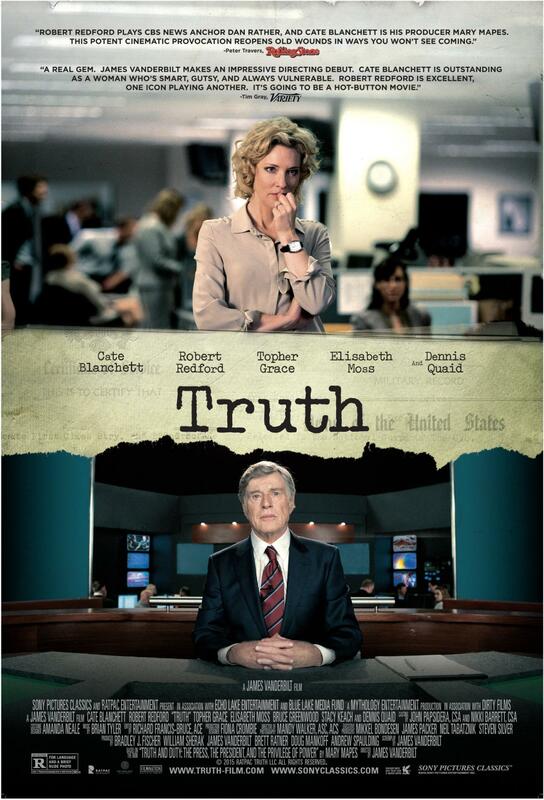 Now, this isn't to say Truth is a bad film (Topher Grace notwithstanding). Blanchett makes Mapes a flawed but ultimately strong woman, one who stands by her acts no matter what. Redford makes Rather into the loyal friend (though at times he does come across as slightly unaware of things). Pity for Quaid, whom I last remember as a Bush-like idiot President from American Dreamz (which I'm sure was not meant to be in any way/shape/form a dig at the former Commander-in-Chief). I found Truth well-acted though a bit heavy-handed and one-sided. A film that discussed the mad rush to get a story for ratings or a film about how financial considerations affect editorial content would make for a fascinating feature film. Pity they made one already...called Network.